The germinal idea for the literate, meticulously-constructed film came from a Time Magazine pictorial article (August 7, 1944) that was then re-fashioned into a novel titled Glory for Me by commissioned author MacKinlay Kantor. Kantor's blank-verse novel was the basis for an adapted screenplay by distinguished Pulitzer Prize winning scriptwriter Robert E. Sherwood (his earlier works were The Petrified Forest and Idiot's Delight). The poignant, moving film realistically transports its present-day audiences back to the setting of the late 1940s, where the film's three typical protagonists return from their honored wartime roles to their past, altered middle-American lives and are immediately thrust into domestic tragedies, uncertainties, conflicts and awkward situations - handicapped (both physically and emotionally) by their new civilian roles. Wyler's Best Picture-winning Mrs. Miniver (1942) can be considered as a companion piece to this film, from the British perspective. Oscar-winning epic director William Wyler's cinematographer, Gregg Toland, known for his depth of focus camerawork in previous films (such as Citizen Kane (1941) and The Little Foxes (1941)) contributed his talent to the three-hour long black and white film masterpiece with richly-textured and crisp images, deep-focus shots, and framed scenes. Wyler had experienced wartime himself in the US Army Air Corps, during which he made three morale-boosting, war-related documentaries: The Fighting Lady (1944), The Memphis Belle (1944), and Thunderbolt (1945). The film was producer Samuel Goldwyn's most successful and important work - he also was presented with the Irving Thalberg Memorial Award. 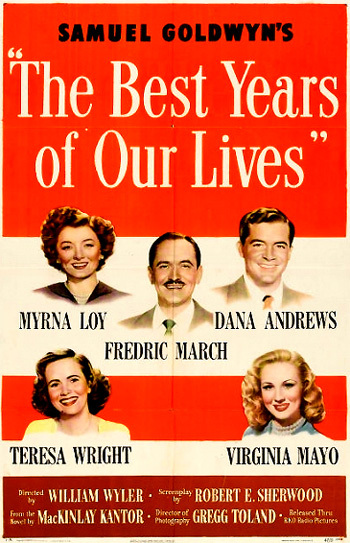 The film was a major commercial success - the biggest box-office draw since Gone With The Wind (1939). The film begins abruptly with a long interior shot of an airport terminal, where returning-from-overseas serviceman Fred Derry (Dana Andrews) lugs his belongings and crosses a map of America on the floor. The war hero inquires at a receptionist's desk about flights to his hometown of Boone City [supposedly patterned after Cincinnati], and is told rather curtly: "Three scheduled daily flights sir, but there's no space available right now...We could probably get you on flight 37 on the 19th." A businessman next to him (with a black porter handling his luggage and heavy bag of golf clubs) requests his airlines ticket which was pre-ordered and arranged by his secretary. The passenger is promptly handed his ticket and told he has sixteen pounds of excess baggage. He reaches for his wallet: "Oh, that's all right, how much is it?" Transportation shortages don't seem to affect everyday civilians as much as returning soldiers. It is suggested that Fred find a ride on the ATC (Air Transport Command) of the Army Air Forces. In the ramshackle interior of the Army terminal's lounge, many other uniformed veterans have been waiting for the few available flights to their destinations. Fred and two other veterans, Homer Parrish (Harold Russell) and a graying Army Sergeant Al Stephenson (Fredric March), are placed on a long B-17 bomber flight with many intermediary stops for a two-day journey to Boone City. Parrish, a young Naval seaman, reveals that he lost both hands in combat - prosthetic, articulated hooks are replacements - when he signs the passenger list. They are relieved to be returning home after "a couple of centuries." Homer: Boy, oh boy, hey, look at that. Look at those automobiles down there. You can see them so plain, you can even see the people in them. Fred: Yeah, it looks like we're flying by a roadmap. Homer: I didn't see much of the war...I was stationed in a repair shop below decks. Oh, I was in plenty of battles, but I never saw a Jap or heard a shell coming at me. When we were sunk, all I know is there was a lot of fire and explosions. And I was on the topsides and overboard. And I was burned. When I came to, I was on a cruiser. My hands were off. After that, I had it easy...That's what I said. They took care of me fine. They trained me to use these things. I can dial telephones, I can drive a car, I can even put nickels in the jukebox. I'm all right, but...well, you see, I've got a girl. Fred: She knows what happened to ya, doesn't she? Homer: Sure, they all know. They don't know what these things look like. Al: What's your girl's name, Homer? Homer: Wilma. She and I went to high school together. Al: I'll bet Wilma's a swell girl. Fred: Then it will be all right, sailor. You wait and see. Homer: Yeah, wait and see. Wilma's only a kid. She's never seen anything like these hooks. Fred: Do you remember what it felt like when we went overseas? Al: As well as I remember my own name. Fred: I feel the same way now - only more so. Al: I know what you mean. Fred: Just nervous out of the service, I guess. Al: The thing that scares me most is that everybody is gonna try to rehabilitate me. Fred: All I want's a good job, a mild future, a little house big enough for me and my wife. Give me that much and I'm rehabilitated (he clicks his fingers) like that. Al: Well, I'd say that's not too much to ask. Fred: Are you married, Al? Fred: Twenty years?! Holy smoke! We didn't even have twenty days before I went over. I married a girl I met when I was in training in Texas. Al: Well, now you and your wife will have a chance to get acquainted. Fred: There's the golf course, people playing golf just as if nothing had ever happened. Homer: Hey, there's Jackson High football field. Boy, I sure would like to have a dollar for every forward pass I threw down there. Good ol' Jackson High. Say, that must be the new airport. Fred: We're turning into her now. Homer: I never knew there was so many planes. Fred: And they're junking them...Boy, oh boy, what we could have done with those in '43!...Some of 'em look brand new, factory to the scrap heap. That's all they're good for now. Bound together as friends after clustered together on the plane, they share the back seat in a taxi-cab ride to their separate hometown addresses. They glance at all the significant changes and how they have fallen behind the times as they drive by: the local baseball park, kids riding a hot-rod jalopy, a hot dog stand, a 5 and 10 Woolworth's department store, a fire station, a used car lot, a diner, and Butch Engle's place with a new neon sign ("the best joint in town"), a saloon run by Homer's uncle. Signs of a return to normality and civilian life are everywhere. Their three faces are grouped together in a shot of the rear-view mirror. Homer is reluctant about being dropped off first: "I wonder if Wilma's home?" Dreading facing Wilma and her reaction to his 'hooks,' he suggests they instead go to Butch's for a couple of drinks. Resolute, Al reminds Homer that he's actually home: "You're home now, kid."